Step aside traditional and say hello to personalization. 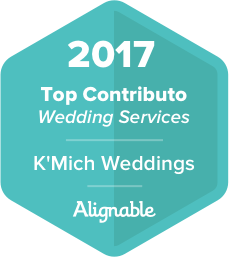 These days, brides and grooms are doing things to suit their styles, personalities, and taste on their wedding day. They want to be entertained while attending their own wedding. They want to enjoy and remember what their invited guests will long after the moment. 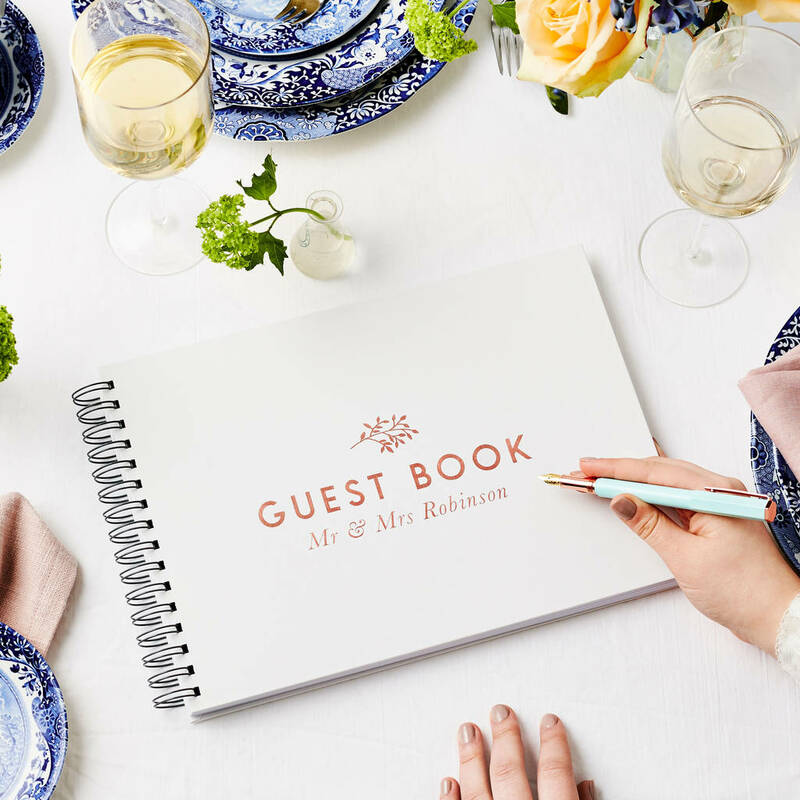 With these great ideas, there is no need for a guestbook assignment.😯😉 Your guestbook will do the talking in letting your guests get involved. Your guests will have fun and be entertained at the same time. See these 10 unique (tailor these ideas to your own tastes, styles, and personalities) ideas we found! 1. 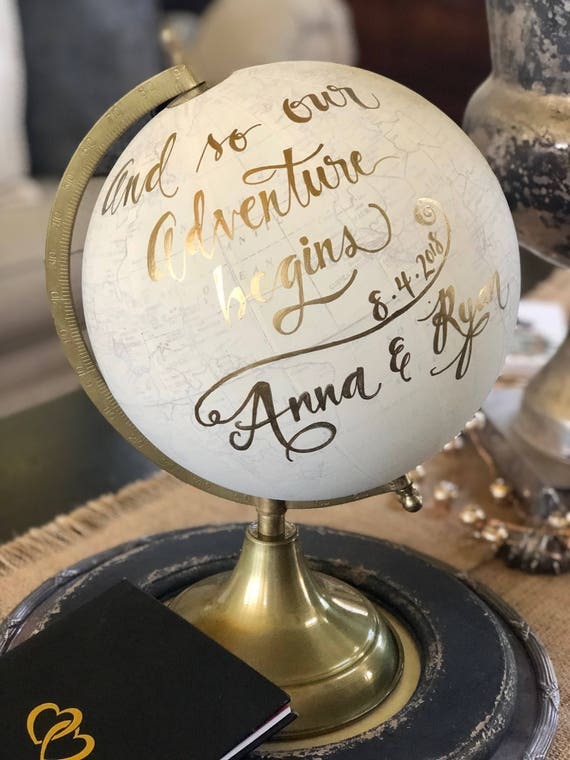 Your guests will be surprised to sign this unique rustic guest book. 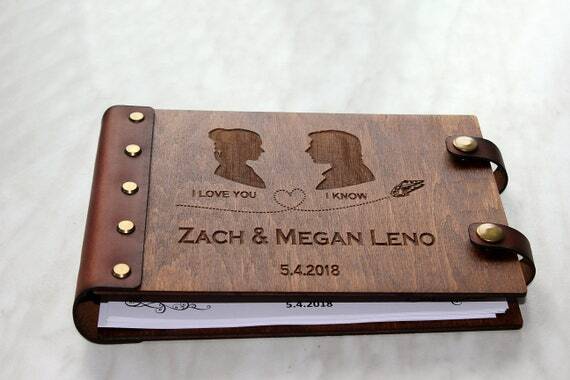 Custom made - engraved your wedding date, names, wedding color(s) and other fun stuff to this. The background is made of wood. You can pick your style when placing the order. 2. 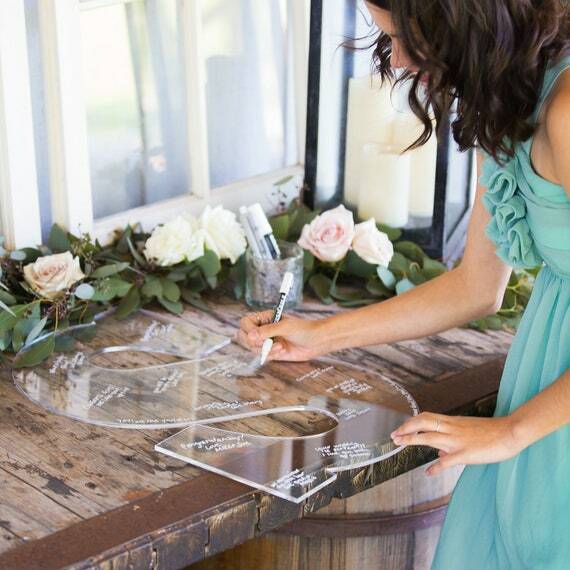 This clear wedding guestbook letter can be used as a guestbook to gather the signatures from your wedding guests. Hang it in your home after your wedding day for a lovely decoration that is sure to be loved forever! 3. Fabric Inspired Quilt Guestbook - For creative notices or even for a rustic ceremony, how about a panô to be your signature board? The panel is made up of scraps (it can be something blue, something borrowed, something old, etc) of rustic fabrics, then turns into a patchwork quilt full of advice, wishes, and quotes! 5. 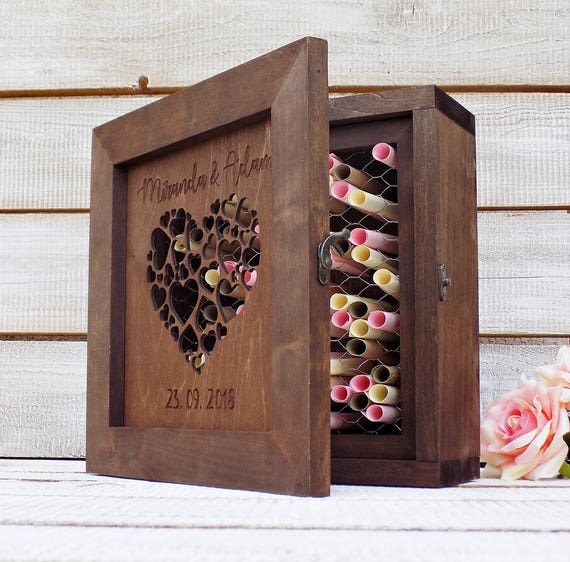 The hearts laser cut wood or MDF are small errands shelters left by the guests of this marriage. 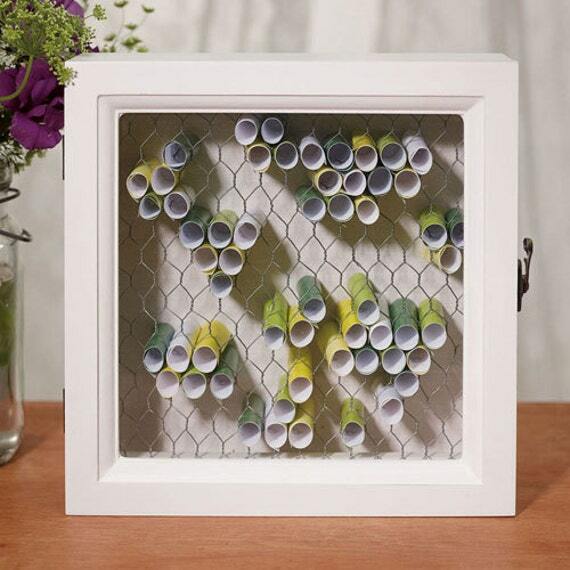 Put them all together in a box frame and then stand admiring and reading the messages through the glass: we like this idea! 6. The guest book puzzle is laser cut and the pieces correspond to the number of guests. 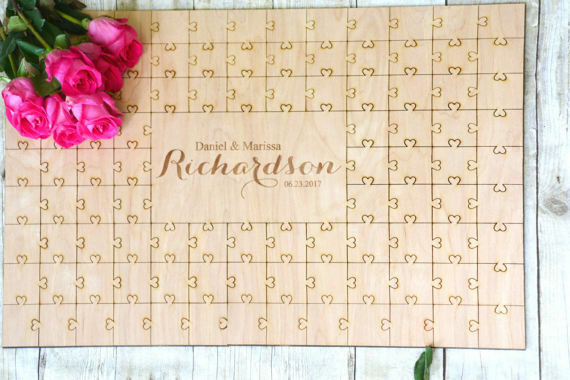 Urban Farmhouse Tampa engraves the happy couple's names and wedding date in the middle of the birch wood product. 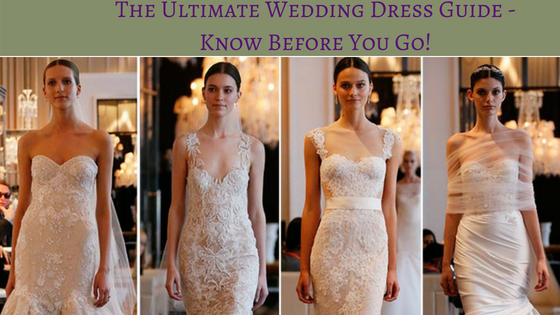 The shop customizes each piece to fit the number of attendees, as well as the sizing dimensions as desired by the bride and groom. 7. Motivate a friendly Jenga-style game. The best part, however, is that each block is engraved— perhaps with the initials or name of each attendant. 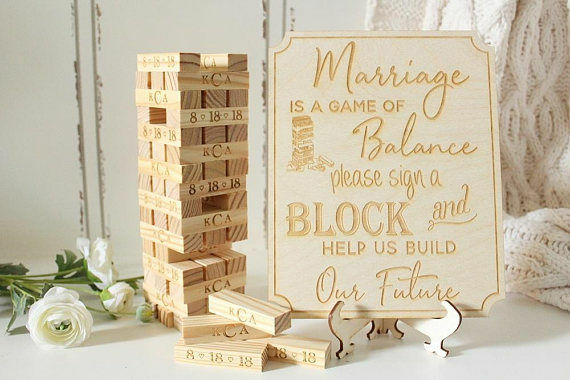 Guests can be invited to write their wishes or advice on the designated wooden blocks. At the end of the event, this would make for a wonderful keepsake. 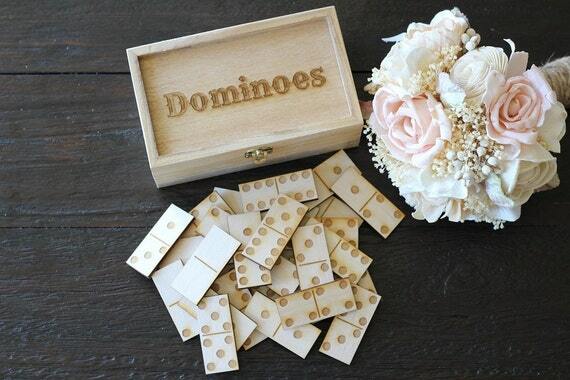 Or, go with the Dominoes below; the concept is the same. 11. 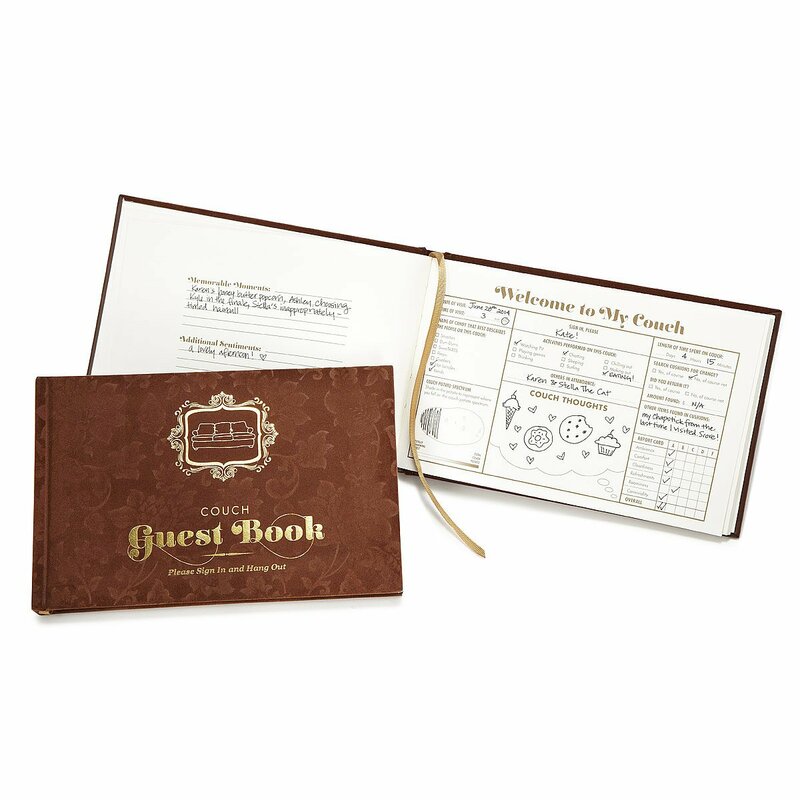 Couch Guestbook - Couch Surfing - Offering clever prompts and space to doodle, this book lets you remember relaxation time with friends. Social couch potatoes rejoice! Keep track of your movie night partners, game day co-fans, and binge-watch buddies with this visitors book. Offering clever prompts for your guests and space to doodle, this fabric-bound book lets you remember makeover show marathons, gossipy catch-ups, and relaxation time with friends--they can even grade the ambiance and rate the overall couch experience. Made in China. Star Wars Personalized Wedding Guest Book Custom Guestbook Alternative Book Wood Guestbook Ideas. Add your names, wedding date, a pic if you want and let the book speak for itself. Share in the comment box your favorite!